My introduction to the design thinking process was during my third year capstone at the University of Rochester. And while it's often used to create digital products, and develop / implement technology - I realized there were some pretty relevant paralells to psychology (my second major). For my speech at the Digital Media Studies commencement ceremony, I shared how students could use the design thinking process to create their life, and career path. But I'm finally sharing my thoughts here with you today for how you can use it in your creative process, and living your DREAM (or as my fiance would say: Live yo' best life!). I've included a few sound bytes of my speech (don't judge me), and I try to outline the process as best I could verbally. But if you're a visual person (like I am) then the below doodle (drawn by yours truly!) is for you. Enjoy! 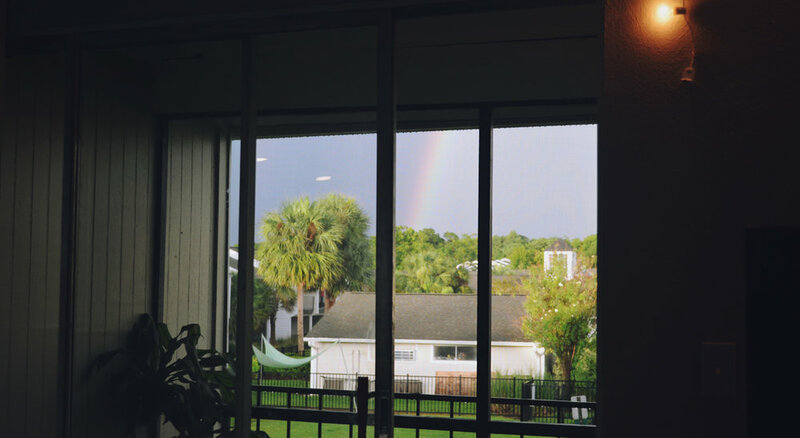 A rainbow right outside my apartment this week. Today's episode is all about kindness and compassion. I picked my friends' Keenan, Ivanna, and Johnnie to share what they thought of the two words and to divulge their own personal stories. I personally think that there is one critical difference between kindness and compassion, but regardless they are concepts we should aim to embody daily. Enjoy! As always, music is by Johnnie. Episode 6 - What's Your Most Prized Possession? What do you value most? Is it a specific object or an abstract concept? For me it's definitely the latter. Over time, I've learned that objects & people want to leave when you cling to them too possessively. My ex once destroyed all of my artwork in a jealous rage. The funny thing is, I wasn't upset because he didn't take away what I'd learned in the process. I could always make more art. I asked my friends and family what they valued most, and the answers were varied. Listen along to their responses. As always, the podcast is totally raw, imperfect, and from the heart. Hope you enjoy it! This past month has been one of deep introspection for me. In early April my grandmother passed away and the event made me reconsider what my idea of success and happiness really is. In this podcast, I talk to my sister Lakyn, Azrael Encarnacion, and my best friend Johnnie. We dissect the concept of happiness on a micro level, through the lens of a perfect day. As a compliment to this podcast, I created a FREE e-workbook to help you to discover what your ideal life looks, and feels like. All the prompts were taken directly out of my journal, and I use them frequently. Print it or use it as a template. Either way I hope it helps give you some insight into yourself. Enjoy! is a free workbook I created for you. It's intended to help you discover what your ideal life looks and feels like. This week's episode is all about collaboration. Brandon & I sit down and discuss the importance of collaboration in art, and also life. As always, it's totally informal and perhaps a bit unpolished, but I hope you enjoy it anyway! What does the ultimate collaboration look like? A brief explanation to why it’s been a little quiet over here. Talking about love, life, climbing the corporate ladder and a bit of insight into why I think I attract positivity. This episode explores the topic of Synchronicity and how it can inspire and inform our lives and creative process. It features stories from some of my favorite people, so take a listen, and laugh along. & a huge thank you to Katie, Naomi, and Brandon! It can shape our lives in big and small ways if we just pay attention. In this weeks episode I talk about what creativity means to me and what my practice looks like on the daily. It wouldn't be complete without getting some insight from Azrael, the most creative person I know. This is a good one you guys! Take a listen now or while you're on the go and let me know what you think. So I did a crazy thing and decided to start a podcast (what!?!). It's been a passion project of mine for a while now and I'm finally here to share it with you! In this episode I discuss how I came to pursue a career in creative tech and the struggles I faced in getting there. This podcast is totally informal, and I hope you feel like its more of a voice memo from a friend than a stranger talking in your ear. I'll be sharing personal stories, interviews and a bit of research here and there all combining three things I'm super passionate about: Creativity, Positive Psychology, and Tech. I hope you'll follow along!